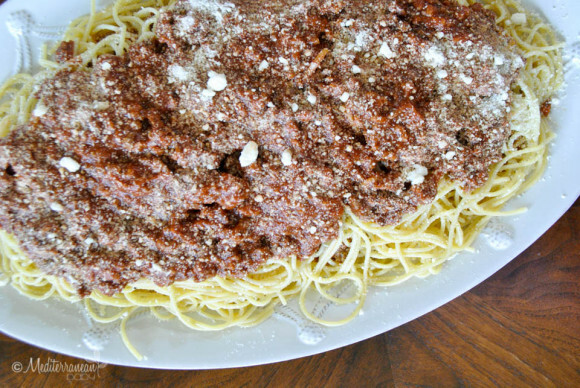 This Greek Spaghetti recipe reminds me of large family gatherings at my Yiayia and Papou’s house. In honor of her upcoming bithday, I wanted to share this recipe with you! Through the years, everyone in our big Greek family always hoped Yiayia, which means grandmother in Greek, was making this dish every time we got together. Lucky for us…most of the time, she was! Although none of us make it exactly the way Yiayia does, this is my best shot at replicating her recipe. It has become a classic at our home. My kids adore “Yiayia Fifi Spaghetti” and it makes me so happy that they get excited for this long-time family favorite. As the sauce simmers on the stove and fills our home with the smells of Yiayia Fifi’s house, this recipe reminds me of family, home, and her love. 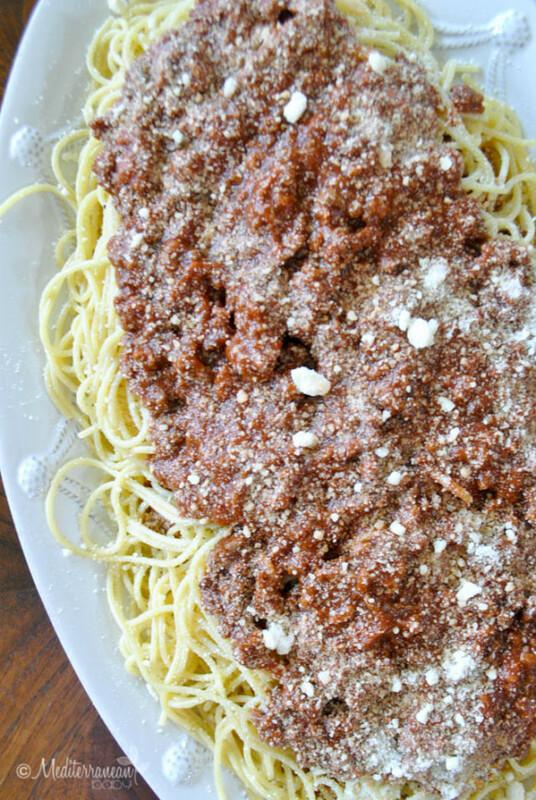 A little sweet and a little spice make this spaghetti a wonderful fall and winter favorite. In a large saucepan, brown ground meat with a drizzle of olive oil. Add sugar, cinnamon, garlic powder, and onion powder to the meat. Add tomato paste and water to the pan and combine thoroughly. Season with salt and pepper. Add bay leaf to the sauce and reduce heat to simmer. In the meantime, boil water and cook pasta to desired doneness. While the pasta is cooking, brown butter in a small skillet. Be careful not to burn the butter, but instead allow it to brown until you smell a nutty fragrance in the air. Drain pasta and toss in browned butter. Remove the bay leaf from the sauce. Using a large serving platter, plate half of the pasta and top with half of the sauce and Parmesan cheese. Repeat and serve. I have such fond memories of this! My grandma always used Romano cheese or myzithra but I find it’s good with any hard cheese. We also use a variety of meats. This is definitely a family favorite and reminds me of my grandma as well. But my mom mediterranean friends don’t seem to appreciate this as much as I do! Thank you for sharing! I don’t know why this dish is not more popular. Perhaps we have all kept it a (Greek) family secret.
. But what you might not know Nicole is that YiaYia always served fresh cut French fries with it and with EVERY meal because that was Papou’s favorite side to EVERY meal !!!! A very beautiful story in honor if Yiayia’s birthday!